With that historic speech, President Ronald Reagan set the wheels in motion for the creation of the National Endowment for Democracy (NED). This private, bipartisan, congressionally funded foundation helps fund four U.S. organizations that represent the building blocks of a democratic society. One of these organizations is the Center for International Private Enterprise (CIPE), an affiliate of the U.S. Chamber of Commerce. CIPE operates at the intersection of democratic and market reforms. For 30 years, its purpose has been to help people around the world realize the promise of economic freedom and democratic participation. By including the business community in the reform process, CIPE helps put real economic solutions in the hands of decision makers. In partnering with associations, think tanks, media groups, and other civil society organizations, CIPE brings a wealth of knowledge from its experience conducting 1,300 reform programs in more than 100 countries around the world. 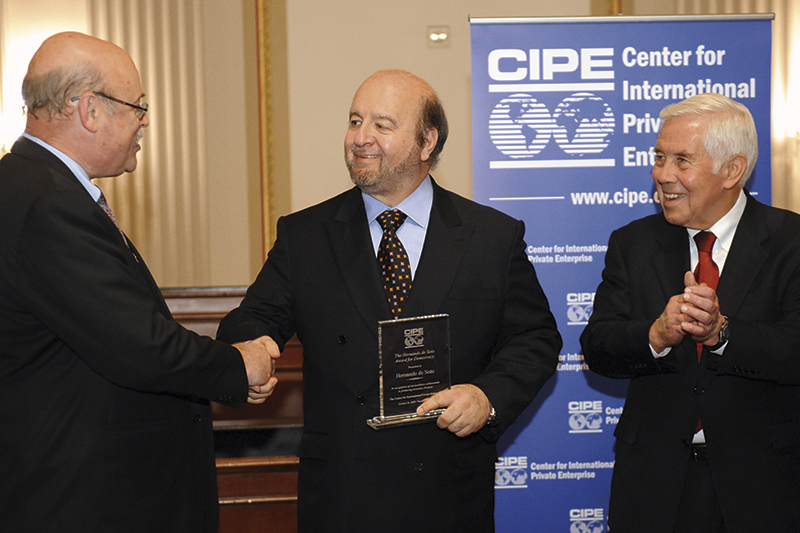 CIPE’s 100 employees worldwide provide technical expertise and reinforce private sector advocacy. In developing a program strategy, CIPE focuses on the root causes of the key problems that countries face, including corruption, lack of jobs, and poor functioning of public services, and it works to remedy the underlying causes. CIPE has been at the forefront of key reform initiatives from Egypt to Russia, from China to Venezuela, and from Iraq to Pakistan, engaging business in policy reform, removing barriers to participation for historically underrepresented groups, strengthening governance processes, building the capacity of civil society, improving the quality of economic legislation, and reducing corruption. Support to more than 100 associations in Ghana has helped farmers fortify their advocacy skills and dialogue with local officials. In Pakistan, CIPE revised the Trade Organizations Ordinance in 2006 allowing women to independently form chambers of commerce. Since then, eight women’s chambers have officially registered in Pakistan. In Yemen, the CIPE-sponsored documentary film Destructive Beast addresses corruption’s damage to the economic, political, and social fabric of Yemeni society. Government agencies are using the film and its policy recommendations to train officials to reduce corruption. In Peru, CIPE partner Instituto Invertir has opened the door to entrepreneurship for university-age students through its EmprendeAhora program. Nearly 2,000 users from more than 100 countries have registered with CIPE’s online Development Institute. Sullivan and his team are particularly proud of their work with young international professionals. Through the Chamber LINKS and Think Tank LINKS (Leaders, Innovators, and Knowledge Sharing) programs, CIPE provides talented young professionals from chambers of commerce, business associations, and think tanks worldwide with the opportunity to be fellows of host organizations in local communities in the United States. Thirty-one fellows from 21 countries have participated in the programs. After working with their host organizations, these professionals can bring home new ideas and approaches to help their organizations advocate for the private sector. For its 30th anniversary, CIPE is focusing on the pivotal role that entrepreneurs play in leveraging economic and democratic change. In 2013, CIPE hosted an international conference in Chicago, Democracy that Delivers for Entrepreneurs, which attracted more than 100 participants from around the world to hear about lessons learned and best practices and the institutions that are needed to build and sustain a productive, inclusive entrepreneurial environment.